New York or New York City, is the most populous city of United States, is both the second largest city of the continent which places it among the largest in the world. 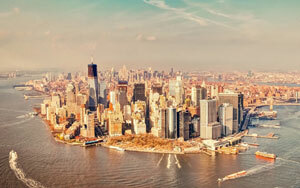 New York is more than a century one of the world's main financial and commercial centers. Given its importance, is considered a global city because of its influence in communications, politics, entertainment, education and fashion. His influence on the artistic and cultural development is the strongest in the north country. It is also an important point in international relations, to be in it the headquarters of the United Nations. The city comprises five boroughs or districts: Bronx, Brooklyn, Queens, Manhattan and Staten Island. It has nearly nine million inhabitants in an area of 830 km2, so, as he became the second city with the highest density, behind Union City, New Jersey. New York has many neighborhoods recognized worldwide. It is also the birthplace of many American cultural movements, such as Harlem in literature and visual art, abstract expressionism (also known as the New York School) in painting, and hip hop, punk and Tin Pan Alley in music. His famous Metro operates 24 hours a day, plus the constant movement of traffic and people, make New York is known as the "city that never sleeps." New York is located in the northeastern United States, midway between Washington and Boston. Located at the mouth of the Hudson River, a naturally protected port and empties into the Atlantic Ocean, which has helped the growth and importance as a trading city. Most of New York is built on three islands: Manhattan, Staten Island and Long Island, it makes the building land is scarce causes a high population density. The Hudson River flowing through the valley of the same name to the Bay of New York, separates the city from New Jersey. Between New York and the city of Troy, the river becomes an estuary. The East River separates the Bronx and Manhattan from Long Island. The Harlem River, between East and Hudson Rivers, separates Manhattan from the Bronx. The city land has been altered considerably by human intervention, several areas have been won from the river since Dutch colonial times. This is most notable in Lower Manhattan. The highest point of the city is Todt Hill on Staten Island (124.9 meters above sea level). The top is covered by forest, is part of the Staten Island Greenbelt. New York has a humid continental climate resulting from the constant winds that bring cold air from within the Americas. New York has about 4,500 such buildings skyscrapers, more than any other city in the world. New York has important buildings in a wide range of architectural styles. These include the Woolworth Building (1913), neo-Gothic style. In 1916 a municipal resolution set a minimum required space between buildings and the street line, so that the sun came into the streets. The art deco Chrysler Building (1930) reflect these new requirements. The building is considered by many historians and architects as the best in town, with its distinctive ornamentation, consisting of eagles and a V-shaped lighting Moreover, an important example of international style in the United States is the Seagram Building (1957). The city has many neighborhoods and buildings known around the world. For example, the Statue of Liberty and Ellis Island, which received millions of immigrants who came to America in the late nineteenth and early twentieth centuries. Wall Street is a major global financial center since World War II and is home to the New York Stock Exchange. The city also concentrates many of the world's tallest buildings as the Empire State Building and World Trade Centre towers, which were demolished in the attacks. Stone and brick became the preferred building material of the city, after the restrictions placed on the construction of wooden houses because of the great fire that took place in 1835. New York has more than 113 km2 of parks and 22 miles of public beaches. The city of New York is a global link for trade and international business, and is one of the hubs of the global economy. The metropolitan area is home to the largest Jewish community outside Israel. In fact, the Jewish population of Tel Aviv is outnumbered by the New York. About 12% of New Yorkers are Jewish or of Jewish descent. It is also home to a quarter of the aborigines of the country, and the larger black community of any city in the country. Bronx is the northernmost district. In it we will find the Yankee Stadium, the home of the New York Yankees. Bronx is the only section of the city that is part of the U.S. continental shelf. Is home to the Bronx Zoo, the largest metropolitan zoo in the country with an area of 107.2 hectares and home to over 6,000 animals. The Bronx is the birthplace of hip hop culture and rap. Brooklyn the most populous district of the city and until 1898 was an independent city. Brooklyn is known for its cultural, social and ethnic diversity, its independent art scene, distinct neighborhoods and a unique architectural heritage. It has also long beaches and the peninsula of Coney Island, where in the 1870 established the first amusement parks in the country. Manhattan is the most dense district where they are most skyscrapers of the city, as well as Central Park. It is the financial center of the city and located the headquarters of many major corporations, like the UN, as well as major universities and many cultural attractions, including museums, the theaters of Broadway, Greenwich Village and the famous Madison Square Garden. Manhattan is divided by Central Park in Upper East Side and Upper West Side, and north of the park, called Harlem. Queens is the largest district and may overtake Brooklyn as the most populous borough given its growth. Originally, the district was a collection of small towns and villages founded by the Dutch. Today is mostly residential and middle class. Queens is home to Shea Stadium, home of the New York Mets, and annually takes place the U.S. Open. In the district are the two major airports, John F. International Airport Kennedy and LaGuardia Airport. Staten Island is a district connected to Brooklyn by the Verrazano Narrows Bridge and to Manhattan via the Staten Island Ferry. Staten Island has about half of the protected area of the city, one third of the district is wooded area.